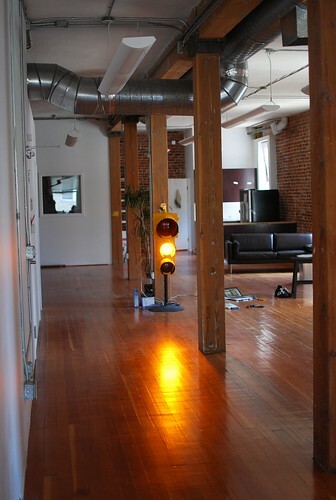 A couple of months back, the guys at GitHub bought a stoplight. They ordered it on Ebay from a seller in the UK. Their plan was to hook it up to their build system. 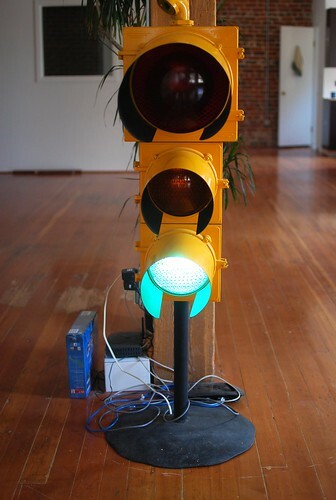 The idea was that when they check code into their continuous integration system (see defunkt/CI Joe) the stoplight would turn yellow while the code was building, red if the build failed because of failing tests, and green if the build succeeded. It would give them a large unmissable indicator in their office for the status of their current code. One of the GitHub founders, PJ Hyett played around with using an Arduino to integrate with the continuous integration server. He wrote a ruby script that polled the server and then sent a serial message to an Arduino which turned on an appropriate green, yellow, or red LED. This worked, but had a couple of downsides: first it required a laptop to be connected to the Arduino to talk to the CI server; second it only lit up little LEDs rather than the big beautiful stoplight. For good reason, as a beginner PJ balked at the idea of controlling the AC power needed by the stoplight. After all, AC can kill you. Melissa Severini, GitHub’s admin, got in touch with me to see if I was interested in taking on the project of hooking up the stoplight. I told her I definitely was and got to work putting together a proposal. My goal was to improve PJ’s take on the project by handling all of the networking on the Arduino itself and, of course, to control the actual stoplight rather than just LEDs. 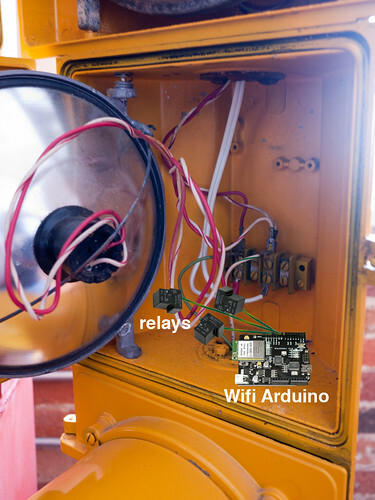 On the AC side, having read Sparkfun’s tutorial on controlling AC with relays, my plan was to connect one relay to each of the stoplight’s lights and then to run all of those to a single Arduino which would itself connect to GitHub’s CI Joe instance over their office wifi. As you can see from that photoshop mockup, I was planning on using the Asynclabs BlackWidow for the networking part of the project. The BlackWidow is a neat little Arduino variant which has wifi hardware built into it. In the final planning stages, this was the component of the project that changed the most: I ended up ditching the wifi in favor of using Ladyada’s ethernet shield with a Wiznet module to connect the Arduino directly to GitHub’s router via an ethernet cable. There were two main reasons for this decision: first of all, I realized that trying to run a wifi antenna inside the solid steel box of the stoplight’s housing was probably not the smartest idea, and second I found asynclabs’ wifi code for the Arduino to be simply too complicated for me to wrap my head around in the few days I had to prepare before traveling out to SF. I was able to get the BlackWidow to connect to a wifi network, but never to actually reach out beyond it to real URLs on the internet. So, my proposal submitted and accepted by GitHub, I ordered parts and scheduled flights. The second week of May, my parts began to arrive and I soldered up the Sparkfun relay boards and tested them with my Arduino. I also talked with Tom Igoe, ITP professor and member of the core Arduino team, who gave me a bunch of great advice about using the relays safely and also explained how to power the Arduino itself off of the AC power as well as the stoplight (a subject I’ll return to later). Last friday, I flew out to SF with a bag full of electronics: 7 Arduinos, 3 USB cables, a soldering iron, a pair of wire cutters, 2 packages of rubber feet, three spools of threaded hookup wire, 3 relays, etc. etc. I was surprised my bag made it through security with nothing more than a TSA inspection notice slip. And on Saturday, the build process began. Thanks to Andy Delcambre, I’d seen photos of this setup in advance and taken it into account when coming up with my plan. Andy was extremely helpful in the planning of this project and throughout its execution; I couldn’t have done it without him. After having checked out the wiring for myself, I spent the rest of my first day in the GitHub office installing the relays. A relay is a physical switch that can be closed by running a small amount of electricity through a pair of electromagnets. The result is a device that lets you control large amounts of electricity (like 120V AC) via small amounts (like the 5V DC that comes off an Arduino’s pins). As I mentioned before, I’d soldered up three of the Sparkfun relay breakout boards before coming out to SF. 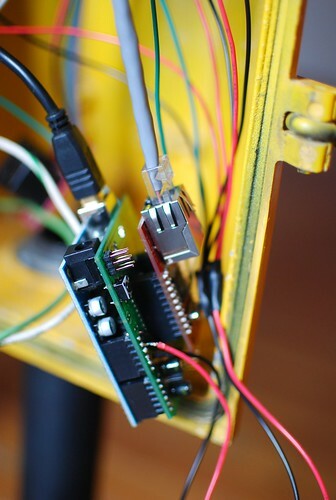 These have three wires that get connected to the Arduino: ground, +5V, and a control line that goes to one of the digital pins. On the other side, it has two terminals for the AC connection. 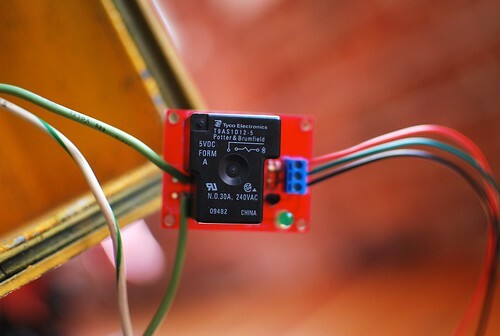 The idea is that you break one of the two AC wires going to your target device (in this case one of the stoplight lamps) and solder the relay into the break. Then when you pull the Arduino control pin high, the AC part of the circuit is closed and your devices turns on; when the control pin is low, the device is off. Having proven that the relays could control the stoplights, I went ahead and attached relays to the other two lamps as well following the same procedure, testing each one in turn. Now, I had control of all three of the lights. The next step was to connect to the internet. To do this, I attached the Ladyada ethernet shield with the wiznet module to my Arduino and plugged an ethernet cable from that into the GitHub office router. After a bit of googling, I came across the Arduino String library which includes a “contains” method that will search a given string for some substring and return true if the substring is found. If I formulated the request correctly from the Ethernet library I could get the library to print out the response headers which include the status, which I could then pull out using this contains method. Once I had that figured out, I pretty quickly put together a sketch that would poll a given URL and blink the red lamp if that URL was 400 and blink the green lamp if it was 200. I tested my code against a URL on a server I controlled so I didn’t have to ask the GitHub guys to force a rebuild of their site every few minutes while I was working on things. 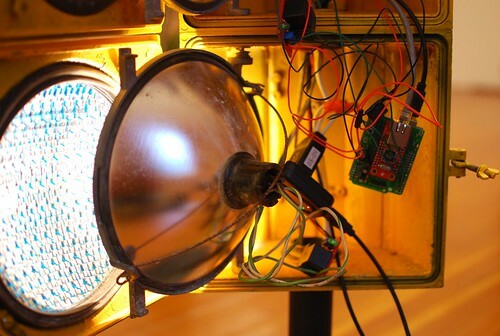 Now at this point, all the pieces of the project were theoretically in place; all that was left was putting it all together, pointing it at the real GitHub CI server, and rewiring it so the Arduino itself would also be powered from the AC coming into the stoplight from the wall. Before I’d left New York, Tom Igoe had suggested simply wiring a two-prong outlet in series with the stoplight’s AC power cable and using that to power the Arduino so I didn’t need a separate power supply. 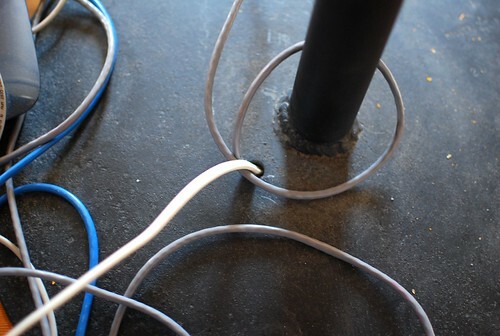 I cut this cord just below the bank of screw terminals and ran it back into the stoplight through a small hole in its steel base (a hole I’d also run the ethernet cable through earlier). Then, as you can see in that picture, I just plugged in the AC-to-USB power converter and ran a USB cable to the Arduino. Not the most elegant solution (and I could definitely have benefitted from a shorter USB cable that wouldn’t have taken up so much space inside the cramped stoplight case), but it did the job and was pretty straightforward and danger-free. 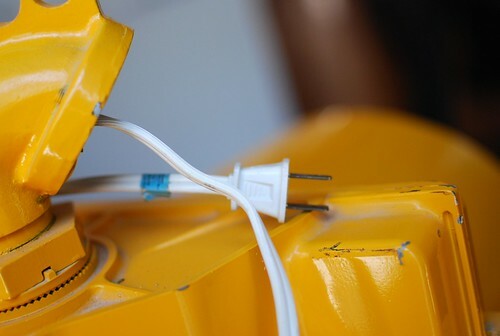 Now, the whole project was powered by simply plugging the stoplight’s trailing power cord into a wall outlet. I switched the Arduino over to point at GitHub’s real CI server and updated my response parsing and boom, the lights were switching based on the real status of the build. I also rewrote the code slightly to use the Arduino’s timer library so that the current light would stay lit even while the Arduino was keeping track of the 10 seconds it was supposed to wait between polling the CI server. Theoretically, the project should have been basically done at this point. But after I let it run for an hour or so, I noticed that the Arduino would start to get stuck, getting only an “incomplete headers” message from the Ethernet library on every response even when I could see that the server was doing the right thing when I hit it in the browser. Thankfully, I had one more day before it was time for me to leave to head back home so I asked the ITP mailing list for help. Tom Igoe was nice enough to step in and save the day again by letting me know that there’s apparently a memory leak or some other problem in the Ethernet library and that the best way to keep it reliable over long periods of operation is to connect the Ethernet shield’s reset pin to one of the Arduino’s digital outputs and then pull it low after each successful request so that it will reset. The next day, I came back into the GitHub office and followed his advice. After I figured out that I needed to call Ethernet.begin() again after resetting the shield, it worked like a dream, making requests reliably for a few hours. At this point I declared the project feature complete and set about shoving all the electronic guts back inside of the stoplight case. In the planning stages this was something I’d actually been quite worried about because I assumed that, being steel, the stoplight case would be conductive and hence prone to making shorts on my boards. On the second day of the project, however, I had the presence of mind to test the stoplight with my multimeter and, much to my pleasure, I discovered that the layer of paint coating the thing was not conductive at all. 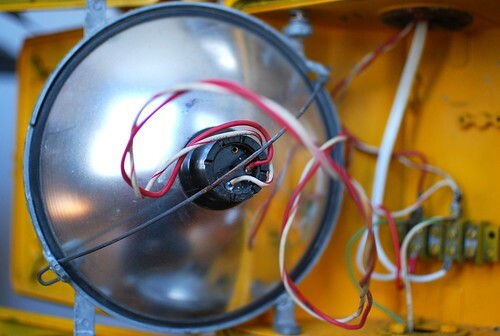 In fact, nothing inside of the stoplight besides the screw terminals themselves were the slightest bit conductive. This made the prospect of stuffing quite a bit of wire and PCB into the stoplight safely much more likely. 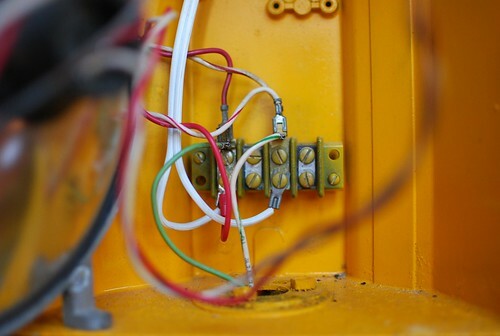 So, I covered the AC connections of the relays with hot glue as a safety measure for anyone who might accidentally end up in close proximity to them with the stoplight still plugged in, and basically just shoved all of the wires inside until the case would close. It was a tight fit, but it worked in the end with space to spare. I closed the whole thing up and got the guys to run a build and, lo and behold, the stoplight turned green! I just want to say a big thanks to PJ Hyett, Chris Wanstrath, and Tom Preston-Warner, GitHub’s founders, for bringing me out as well as GitHub’s Kyle Neath who helped set up the CI Joe integration. This project would have been much harder and more dangerous without Tom Igoe’s advice and Andy Delcambre’s help at every stage of the build. And, of course, a big thank you to Melissa Severini for thinking of me for this project in the first place. If you want to learn more, the code is, of course, on GitHub: atduskgreg/GitHub-Stoplight. And if you want some hardware bling for your own startup, don’t hesitate to get in touch. Greg, Thanks for the heads up I’ve given the poster a kick up the backside! I’ve added you to our RSS! As a real-world embedded developer, the level of sheer quackery surrounding the use of AVRs (sorry, “Arduino” for the hipsters) never ceases to amaze. You _really_ need to go back and remount those boards, preferably outside the stoplight. Remember, light bulbs get hot. When lightbulbs get hot, the inside of the stoplight gets hot. When the inside of the stoplight gets hot, hot glue gets soft, and maybe melts. 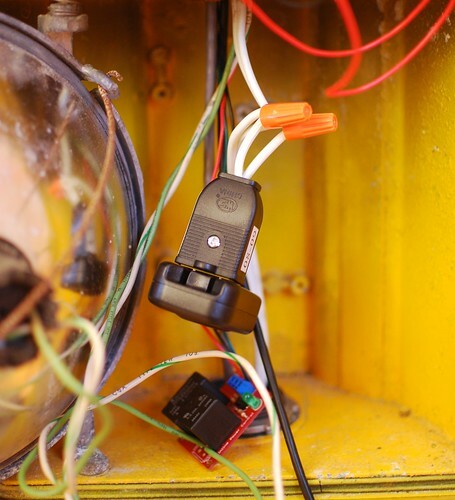 Then your relay terminals [at some point] WILL come into contact with the metal body of the stoplight through a scratch in the paint. Then you’ll kill some poor githubber. Get someone to design a real board for this [simple, and costs $100 to get it fabbed in china], and mount it in an enclosure on the back of the stop light. Awesome, this looks like a really fun little project! I have to side with Gward here. Like him, I’m a professional embedded systems engineer (MSc). A lot of things you mention in your article make me cringe. The microscopically thin layer of paint on the inside is not conductive, so you just stick the entire ratsnest in and forget about it? Holy cow. I wonder if you even bothered to earth the case. It’s nice that you can make fun little projects with an AVR, but clearly that does not qualify you for real-life jobs like these. No offense, but if you need to ask for help on how to hook up a relay, and have to resort to resetting the ethernet controller after every request, some bells should begin to go off in your head. Apparently they didn’t, leaving GitHub with not only a poorly designed and manufactured, but also dangerous product. Please think twice before basing a career on your AVR hobby. If you start selling these, I will buy one (or two) for my gaming company. http://motherbug1.buglabs.net/service/Servo. We’ve even created a (still beta) BUGDuino module for people out there who are looking to do similar things. If you need to rewrite this, check out my Webduino library (http://webduino.googlecode.com) — it’s a webserver implementation on the Ethernet shield that simplifies the networking bit. I’ve not tried adding Wiznet reset logic to the library, but that sounds like a nice change for the next version. @archels & @Gward – this project isn’t about being a professional EE, it’s about having fun and doing something that pops into your mind. And just because the Arduino is High-Level doesn’t make it hipster, Arduino makes it accessible to people who have creativity and want to produce objects and not worry about the “right” way of doing something. EE’s shouldn’t feel endangered but rather enjoy people exploring electronics. Greg, nice work! Great documentation! Looks great! 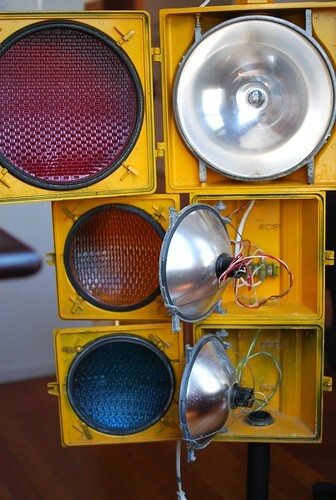 Strange that you got US style traffic lights from a UK seller. I used a parallel port relay board, rather than an Arduino, so that I can control them with a ruby script. It was much easier to program. Richard — Cool project. That parallel port relay board looks interesting. 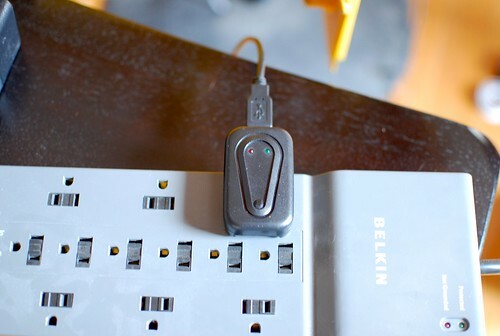 Do you have to keep it plugged into a desktop/laptop? That was part of why I went the arduino-ethernet route: I didn’t want the GitHub guys to have to keep a laptop plugged into the thing at all times. John — Thanks for the defense there. I think you captured the spirit of this project perfectly. @Greg – yes, it has to plug into a computer (and one with a parallel port, which isn’t that common any more :-). The pros are that it’s a great deal easier to write (and debug) a ruby script which scrapes a web page and changes the lights than program an Arduino. The cons are that there has to be a PC on and connected by a wire to the lights. However, that’s not an issue in my office. Reminds me of my old EE course. The professor brought in a black box we needed to control. 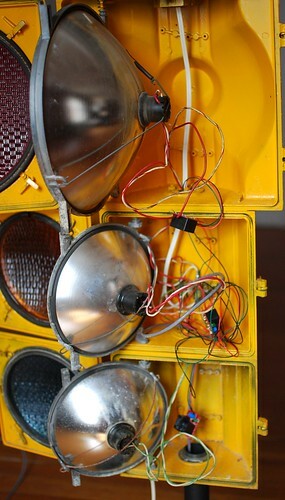 The box interfaced with a set of traffic lights. Good stuff. The idea is a nice one and I might have a go myself. However: short of talking about how you remembered to inhale and exhale throughout, I’m not sure you could have drawn out your explanation, of interfacing some relays to a microcontroller and using an off the shelf ethernet library, any longer than you already have. Good lord. And yes, the 0.1mm of paint is insulative but you really have to do a better mounting job – it’s not something that a teacher would ever accept of a school student in technology class, let alone it being a project that uses mains. Why you you think people earth appliances? It’s good that you’ve learnt a lot doing this but please be aware that you’ve made a fairly poor job of a relatively trivial task. The good news is, the only way from here is up. Sweet stuff. You could extend it so that it lights red OR green while lighting yellow to indicate what the previous build result was during building.